Serral headed to BlizzCon with a lot of momentum. Foreigners (or non-Koreans) that were hyped among fans in the past were only defeated by a Korean in the end. For Serral, however, the narrative was different. Many fans, analysts, and casters believed he will be the non-Korean player to win not only a premier tournament but the world championship. The final game was intense. The crowd was sitting, anxious, as both players fought back and forth. One minuscule mistake from either player meant the other can capitalize considerably. 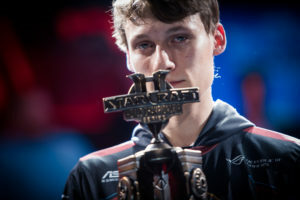 The crowd erupted when Serral finally overcame his opponent: we were witnesses to something never-before-seen in StarCraft’s history – a foreigner becoming the world champion. After the historic match, the 2018 WCS Champion Serral had a few minutes to talk about the final matches and where he thinks StarCraft esports will go from here. In Games 1 and 2 against Dark, you were so close to losing. What was going through your head during those attacks? I feel like I could have won both games pretty easily, but I think I was playing a bit too carefully. Especially on the second game after I defended his nydus attack, if I played like I would have played at home, made a bit more drones, I think I would have won the game pretty easily. It was tough, he had a high Ravager count, so it was hard to attack into him. I think I tried a bit too hard, I should have played more defensive and just played for Hive instead. How did you defend those attacks? I guess I had enough units (laughs). It was enough to defend. The remaining players in this tournament were two-time BlizzCon champion sOs, last year’s BlizzCon champion Rogue, and Stats who is always a threat to any tournament. Out of those players, who do you think is your hardest opponent? I would say Rogue is the hardest opponent out of those four. It was always going to be a good match. Throughout the year, you’ve been playing StarCraft at a level that we haven’t seen in any foreigner in the past. What have you done differently to achieve overall success this year? I don’t really know. Last year, I stopped school at the very start and I was building up my skill level. This year, actually it started paying off to play the game full-time. I know why I’ve started to get results – I’ve started to play consistent, which is important in StarCraft. During the grand finals against Stats, how were you able to keep your composure? Most players in your shoes would sink under the stress and pressure playing in the grand finals for any esport. Honestly, I didn’t feel any nerves at any point of the series. Maybe after I lost a couple of games, I felt a bit angry at myself. I felt I did too many obvious mistakes. It shouldn’t have got in my head. You made history winning the WCS Global Finals. Where would you like to see StarCraft go from here? I would like to see more foreigner presence. I would also like better practice in Europe. I think it’s going to stay on the same course for a while, but foreigners are improving all the time and we are playing better than ever before.